There’s nothing like music to transport people to a place of beauty, and the vocal recital “Afternoon in Italy” aims to do just that. Amira Coleman will present a program of light opera, Broadway tunes and traditional favorite at 3 p.m. Wednesday, May 23, at Brookdale/Liberal Springs. The recital is free to the community. Donations are welcome to help fund an opera study trip, sponsored by Wichita State University’s department of vocal music, where Coleman is a student. “This is a way to share the music I’ve been learning all year as a freshman at WSU, and it’s something I love to do — perform for people who enjoy music but might have difficulties getting out to concerts,” she said. “Growing up in Liberal, as a voice and piano student, I always looked forward to recitals like this.” Liberal residents have seen Coleman perform in multiple musicals and plays at Liberal High School and Seward County Community College. As Fairy Godmother in “Cinderella” at LHS, she won “Best Supporting Actress in a Musical” from the Kansas Jester organization. She also played the role of Deloris in “Sister Act” in spring 2017 at SCCC. As one of only two western-Kansas members of the audition-selected choir program at WSU, Coleman has received high praise for the training she brought with her. The “Canta Italia” trip to Lucca, Italy, is part of the opera studies track at WSU. Participants live in a small community in the region of Tuscany, study Italian, receive voice lessons from opera professionals, and travel to Verona for a performance of “Aida.” As the home of Puccini, Lucca is known as “the birthplace of opera,” and sponsors many performances and festivals. 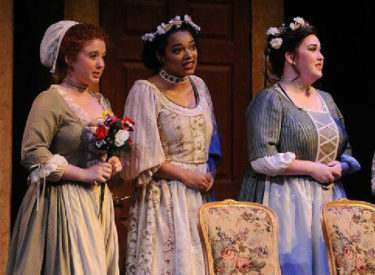 During her first year at WSU, Coleman sang in the a capella choir and the chorus for two opera productions, “The Elixir of Love” and “The Marriage of Figaro.” A member of Dr. Cristina Castaldi’s music studio, Coleman is a double-major at the university, studying music education and musical performance. Her program at Brookdale will offer a mixture of classical and popular music. Alisa Henderson will accompany on the piano. The public is invited to join Brookdale residents for the event. For more information, or to contribute to Coleman’s trip, call 620-417-4278.